Do You Want To See The Cover for The Boy Who Steals Houses?! I’m absolutely beaming right now because it’s time to share the cover for The Boy Who Steals Houses! We are coming ever closer to the April 4th release date (70 days to go, to be specific) and I’ve been doing exciting things like writing acknowledgements (still a surreal experience!!) and seeing page proofs and excitedly awaiting the moment when I get to hold a physical copy of TBWSH. Which is, arguably, the very best moment of all. Preorders do so much good for new small authors (like meeee) and bonus, the book is usually a bit cheaper before release day! If you’re in the USA, your best option is Book Depository! They do free shipping too. Amazon US will get it in, but so far only the kindle is up for preorder. I think this is because I’m not published in the US. But who would know! and you can add it on goodreads…! 🗝 yes there will be ARCs and it’ll be up on Netgalley UK! 🗝 and this is a good time to say…if you ever want to interview me or share about TBWSH or ask any questions — GO FOR IT. I do not bite (well, not on weekends anyway) and I love you so much. I’ve had a few people message me starting off with, “I’m so sorry to bother you…” pfftshtfffsfs. YOU ARE NOT A BOTHER. I’m immeasurably grateful to you. 🗝 The Boy Who Steals Houses is not a sequel to A Thousand Perfect Notes. They’re set in the same universe though!! There may or may not be a wonderfully placed cameo or mention or two. Compared to ATPN’s 288…so someone got long-winded ha ha. Although, as I was reading through for the 180th time and crying over copy-edits, I pledged to myself never again to write over 300 pages. So much more to edit. Why do people write 100K books. Why…why would they. 🗝 The keys on the cover mean things. 🗝 There’s a lot going on in this book and I’m very proud of it. It has homelessness and big messy families. It has anxiety and autism. It’s set in summer, so there’s popcorn and mangoes and a soft yellow pocket of happiness before everything goes really bad. It has brothers with a very intense relationship. It has a very soft and tentative romance (between a Hufflepuff and a Slytherin). It is a genderbent modernised Goldilocks retelling. There is banter and snark…and also tears and bloody knuckles. When I say “I’m going to make you laugh AND cry…” dude, I mean it. It is dark and light and about being lost and found. It’s about looking for something and stealing the impossible. And there is a heck tonne of brownies in it because I drafted it for NaNoWriMo 2016 and I was home alone for a week and brownies is one of the few things I can bake. So like. There sits the truth of my inspiration. 🗝 I’m never going to get over this whole AM AN AUTHOR thing. It’s just my dream, ok?! The process isn’t all perfect and I still have so many wishes I’m desperate to come true. But just !! knowing people read and enjoy my work, having publishers and an extraordinary agent who root for me, and being able to unravel the stories that make my heart beat faster…I’m so so grateful. well I am a happy swamp right now!!!! what do you think?! are there fairy tales you wish were done in contemporary and/or genderbent? ready to be broken by meeee again? Oh? Oh What Is This? 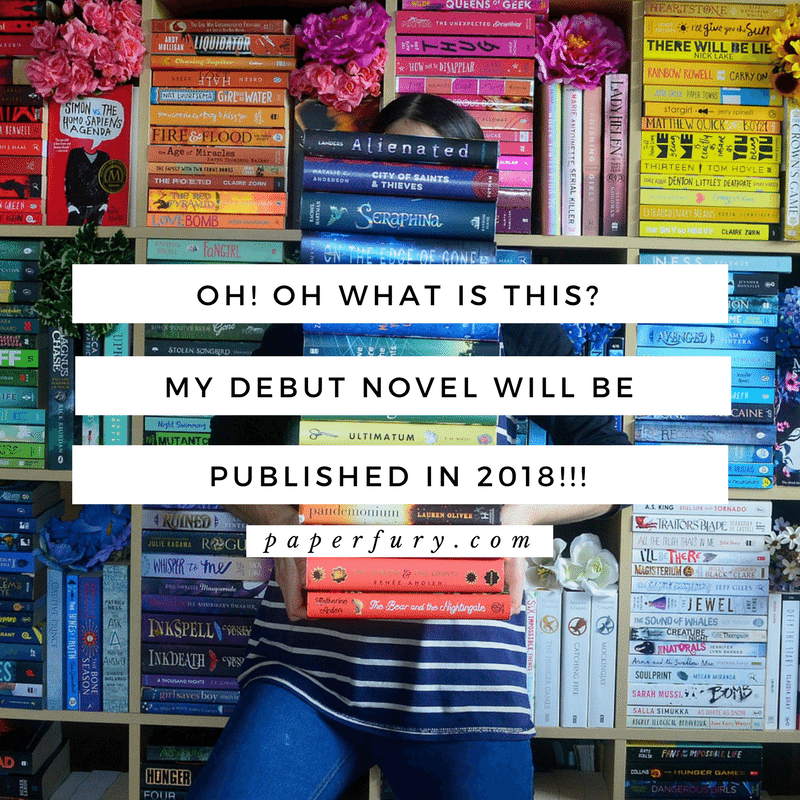 My Debut Novel Will Be Published in 2018! I have simply extraordinarily delicious news for you today because, HI, my debut novel is BEING PUBLISHED. You have no no idea how long I’ve waited to tell you this. And also how long I spent trying to title this post. I swear, titles are the actual death of me and take 5 years off my life every time. But we can’t get distracted today. We must talk books. 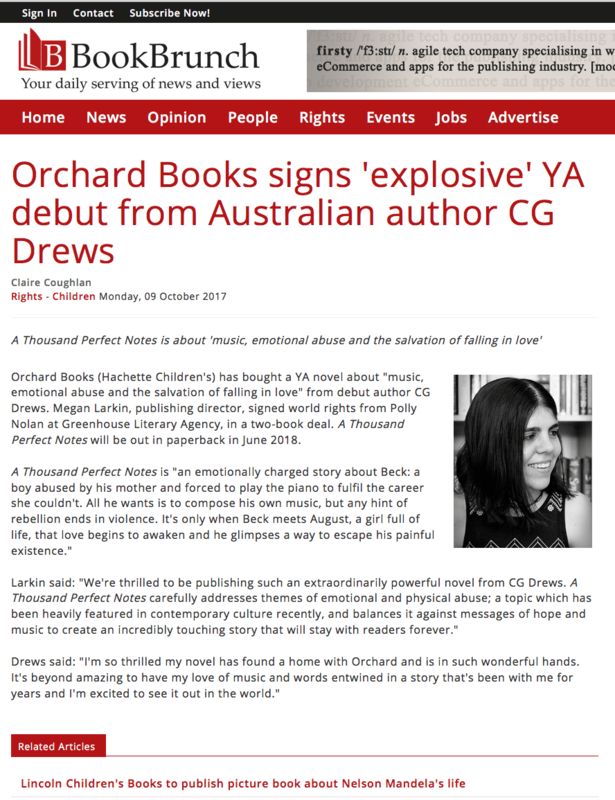 I’m so freaking proud to announce my first novel, A Thousand Perfect Notes, is coming June 2018 with Orchard / Hachette Children’s Books! I have worked so so long for this and I’M SO HAPPY TO FINALLY SHARE THE NEWS WITH YOU. If you’ve been reading my blog for a while, you probably know that I’ve been pursuing publishing for 4 years. I’ve been dreaming of it for nearly 8 years. And in 7 months??? Holy heck, peoples, you will get to hold my small novel in paperback. I will be in a bookstore. I will write more books. I will hopefully make this my career. I will try not to eat the moon. LIKE CAN I TAKE A MOMENT. Usually people wait till they’re asked questions before answering them, but I’m very clever and have decided to answer some questions YOU NEVER ASKED and also probably never will ask. You’re welcome. A: A Thousand Perfect Notes! Q: Is that like…notebook notes? A: No it is like musical notes because this is a story of pianos and darkness and I really can’t say anything more than is in the pitch so GO READ ABOVE. Q: Ok ok, so who the heck is CG Drews? A: Me, you dense nutmeg. Now you know all my secrets. Q: I do admit I’m kind of disappointed to see you have a human head. A: I actually am disappointed too. Q: I saw it’s on Goodreads. A: It is! The blurb will be changed in the future though, so keep your eyes peeled. The pitch in my press release does say “salvation through love” but it’s not really. Ha…trust me pls. A: TWO BOOK DEAL. My second novel comes out in 2019 and you know nothing about it mwahah haha. Q: Will there be ARCs? Q: On a scale of 1 to Mt. Doom when Gollum fell in with the ring — how freakishly excited and prone to combustion are you? Q: So all the times I’ve asked this year “when are you getting published?” and you said “I don’t know!” you were lying? A: Look I said I was from the dark side. These things happen. Q: What does this mean for PaperFury.com? A: Honestly I’m NOT sure. 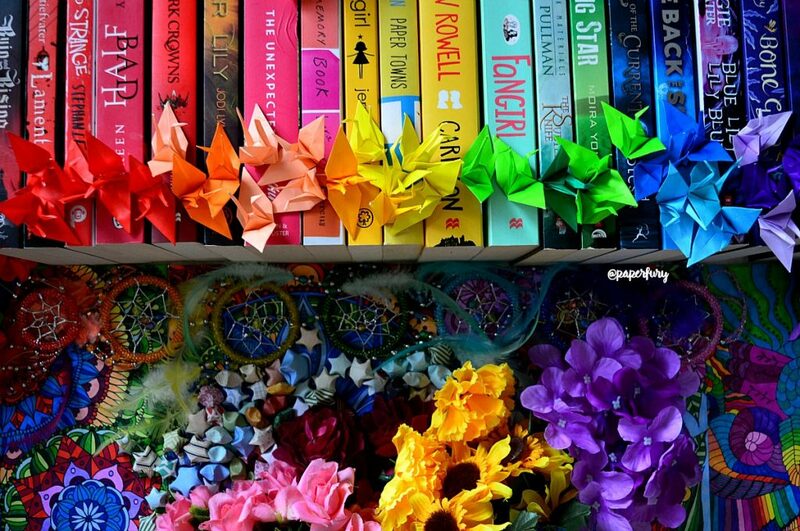 I love blogging and will have tons to say if I don’t do book reviews…but I’m just not sure if it’d be appropriate for me to review books now. But the chances of me stopping blogging? HAHAHA 0% MATE YOU’RE GOING TO HAVE TO SUFFER THROUGH THIS BLOG FOR A WHILE LONGER. Q: When will we see the cover? A: IDK MATE, BE PATIENT. Q: I’ve already congratulated you on facebook / instagram / twitter, must I comment again? A: No it’s okayyyyy. You don’t have to keep shouting “congrats” haha. I feel bad for repeating myself EVERYWHERE but (a) I’m excited and (b) I’m freaking excited, and (c) I’m making sure everyone knows! Also I’m excited. A little bit. Q: Tell me something cool. A: Ok ok here is something: every single time someone says “congrats!” or “I love this” or “I would give you my castle in Scotland with 94 libraries within” or “I’m so proud of you” — I HONESTLY CAN’T WITH THE EMOTIONS THAT GIVES ME. You are all incredible. You’ve championed my blog and my writing and given limitless encouragements over my art and I just…I’m super thankful. I’M BEING MUSHY AND THE BOOK ISN’T EVEN OUT YET. But this is the truth —> I appreciate your support so much it’s absolutely impossible to summarise it. MARK YOUR CALENDARS OR CEILINGS OR WHATEVER. I NEED TO GO CALM DOWN. i love turning discussions back to you but this is such a flail post…so JUST BEAR WITH ME. if you’re a writer tell me what your sparkly author dreams look like! (my #1 is to walk into a bookstore and see my book) and if you have any advice for authoring + blogging, DO let me know! !